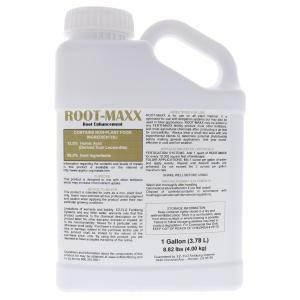 Root Maxx by EZ-Flo is designed to maximize nutrient uptake by encouraging root development for stronger healthier plants. This is not a plant fertilizer but a supplement to be used with a fertilizer. Contains 12% Humic & Fulvic Acid with Mycorrhizae. Can be used all year in cool or hot weather. Sold in a 1 gallon jug. Coverage rate is 40,000 square feet/gallon. Please note: This product not certified for use in organic food production.